Bernie Sanders can now boast four wins in a row and victories in six of the last seven contests for the Democratic presidential nomination. Despite all the talk about the challenges he faces in trying to catch Hillary Clinton, it's still a remarkable achievement given how far back he started from the former secretary of state when the race began last year. The Vermont senator wasn't in Wisconsin to relish the win, however. He chose to spend primary night instead at a rally in Wyoming, which holds its Democratic caucus on Saturday. For Mr Sanders every delegate counts if he wants to catch Mrs Clinton - a formidable task given the sizable lead she built up by routing the Vermont senator in contests across the South last month. But even if it doesn't give him much of a delegate boost, this Wisconsin result does offer Mr Sanders that most precious of political commodities - momentum. 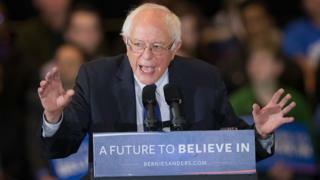 He'll likely post another victory in Wyoming, and then all eyes turn to New York in two weeks - where Mr Sanders grew up and Mrs Clinton served as a senator for six years. Mr Sanders, if his recent string of victories is to be anything more than a political footnote, will need to attract black and Hispanic votes in numbers he has yet achieve. If he can do that, then the narrative in this race stops being Mrs Clinton's inevitability and becomes a question of whether the front-runner can hang on. If New York is the key, however, Mr Sanders's campaign there may be stumbling out of the gate. Today he received a raft of negative press for an interview he gave with the editorial board of the Daily News, a New York City newspaper, that critics say exposes his thin grasp on the issues - and foreign policy in particular. When asked about Israeli-relations, the senator said he didn't know the answer to some questions and wasn't qualified to respond to others. He said he hasn't thought much about where so-called Islamic State leaders captured by the US should be held and didn't know whether President Barack Obama has the right policy to deal with IS. He even demurred on questions about whether the US government has the authority to order the breakup of banks that the president determines are too powerful. "If a bank is too big to fail, it is too big to exist," he said. "And then you have the secretary of treasury and some people who know a lot about this, making that determination." Media captionWill Sanders fans support Clinton should she win the nomination? The headlines following the interview were scathing. "This New York Daily News interview was pretty close to a disaster for Bernie Sanders," read the Washington Post. "Even on bread-and-butter matters like breaking up the big banks, the Democratic presidential hopeful came across as tentative, unprepared or unaware," wrote the Atlantic's David Graham. It didn't take long for the Clinton camp to pounce, either. "We've said for a long time that this primary is about who's really going to be able to get things done," the campaign said in a news release on Tuesday night. "And from reading this interview, you get the impression Senator Sanders hasn't thought very much about that." New York politics can be rough and tumble. The tabloid culture in the New York City tends to reward politicians who are both aggressive and thick-skinned. The Wisconsin win was sweet for Mr Sanders, but he is about to face the biggest test of his campaign. In two weeks he could be on his way back in the race - or left licking his wounds.